At 6462m, Mera is one of the tallest “trekking” peak in Nepal. Despite this label, reaching the summit remains a challenging objective and shouldn’t be underestimated. 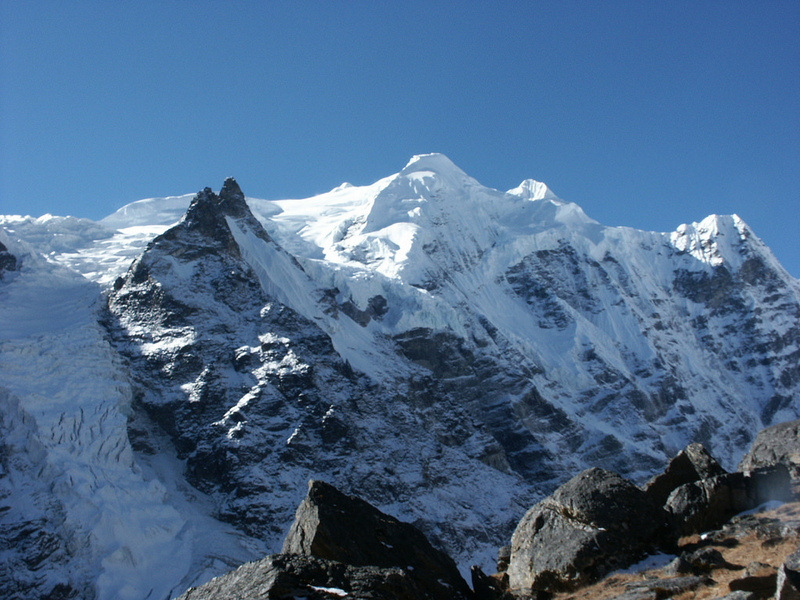 Whilst technically straightforward, the high elevation means that mountaineers are subject to extremes of temperature and a significant risk of developing high altitude illnesses such as Acute Mountain Sickness (AMS), High Altitude Pulmonary Edema (HAPE) and High Altitude Cerebral Edema (HACE). To compound these problems, Mera can be very difficult to escape. In order to return to Lukla it is necessary to descend into the Hinku valley before climbing over the Zatrwa La (4610m). In poor weather this can be a difficult proposition for healthy mountaineers and almost impossible for those who are sick or badly injured. Whilst helicopter rescue is possible, this can be delayed for several days due to bad weather. This article describes an acclimatisation programme that provides mountaineers with an excellent chance of reaching the summit safely and successfully. In addition, it also describes the common problems that may be faced along the way and the solutions that are needed to overcome them. Permits to climb Mera must be obtained from the Nepal Mountaineering Association (www.nepalmountaineering.org). These can either be bought in person or through a trekking agency in Nepal. Most mountaineers approach Mera from Lukla. This is usually reached by a 45 minute flight from Kathmandu. However it is also possible to reach Lukla overland following a bus or taxi ride to Jiri and a trek of between 5 and 7 days. From Lukla, it is possible to approach Mera in a number of different ways. The quickest involves leaving the airport and joining the trail that heads east, stopping at Chutang or a neighbouring settlement, before crossing the Zatrwa La (4610m) and descending to Thuli Kharka and on to the Hinku Valley (3 days or less). A second, much slower approach, is to trek south from Lukla and spent several days passing through Poyan, Pangkongma, Nashing Dingma, Chalem Kharka and Chunbu Kharka before eventually descending into the Hinku Valley at Tashing Ongma (6 to 8 days). See: “Jiri to Everest Khumbu” Map 1:100000 published by Nepa Maps. If you have the time and funds this second approach is well worth trying. Not only does it give you a much better taste of this part of Nepal, its countryside and its people, but it also provides a first class acclimatisation programme. By slowly increasing your sleeping altitude from 2800m to 4200m it gives you an excellent chance to acclimatise and minimise your risk of developing AMS and life threatening conditions such as HAPE and HACE. See this article for guidance on a suitable ascent profile. Each year, fatalities from these conditions are reported amongst mountaineers and local workers who cross the Zatrwa La. Ascending from Lukla (2840m) to the La (4610m) in just a couple of days is not only dangerous but unpleasant too. Without prior acclimatisation you’ll feel tired and incredibly breathless, barely able to appreciate the beautiful valley and high mountain pass that you’re travelling along! Both approaches to Mera finally meet at Khote. This is the first of three settlements you’ll pass before you reach the Mera Glacier. Khote (3550m), Tangnag (4360m) and Khare (5100m) are connected by a series of well defined paths and a considerable amount of ascent! If you feel like you’re acclimatising slowly it is well worth resting for a further day at any one of these settlements. If you’re well acclimatised, the journey between each can be done in just a few hours, leaving plenty of time to prepare for the challenges ahead! Extra days in Tangnag and Khare will be useful aids to acclimatisation even if you’re coping well. Rest day walks from both settlements provide further altitude exposure and give you the chance to sleep a second successive night at the same altitude. A second night at Khare also gives you an opportunity to practice your mountaineering skills on the nearby glacier. To travel above Tangnag you’ll need to know how to use an ice axe and crampons, as well as be comfortable walking whilst roped together in a small group. If you are using tents below Base Camp it is also possible to sleep at other sites along the route. Above Tangnag the path takes you east along the narrow valley floor before opening out into a large grassy bowl. Camp sites can be found here, either alongside a series of small pools or beside the river (Dig Kharka 4650m). Above Khare, shortly before the start of the glacier, there is a series of rocky platforms that provide enough space for a small number of tents (5200m). Unfortunately, water at this site is often difficult to obtain and since the site is only 100-200m above Khare any benefit to your acclimatisation will be small. From Khare it will take you 1-2 hours of uphill walking to reach the edge of the glacier. Once on the snow and ice its worth attaching crampons and roping together. Whilst the path is usually well trodden, crevasses are nearby! The first section of the glacier is flat and rapid progress can be made to the Mera La (1-2 hours). However, in misty conditions the short descent from the Mera La to the site of the Base Camp (BC) can sometimes be difficult to identify. Fortunately, local porters and guides have no such problems and will happily show you the way. To reach the camping areas descend steeply on the left. Normally, a walking pole and crampons are enough, however an ice axe is sometimes required. If you’re acclimatised, the ascent from BC to Advanced Camp (AC) will be completed in 2-3 hours. However, if you haven’t spent sufficient time at Khare or the Mera La Base Camp before you set off, this will take much, much longer. To ensure that you’ll be ready to climb for long periods above 5000m it’s vital that you spend at least 2 days at Khare, and if you have the time available, two further days at BC for acclimatisation. From AC most teams leave for the summit between 0200 and 0400 the next morning. Practically, this means waking soon after midnight in order to dress and pack in good time. In poor conditions it may be possible to delay your departure by a few hours or postpone it until the following day. However heavy snowfall and high winds can make the high slopes impassable for several days and therefore it’s better to descend to the Mera La or Khare rather than endure a lengthy wait at AC. Once you’ve decided to start it’s vital that you remain roped up with other members of your team. Long sections of the route pass very closely to crevasses and you may have to extricate those who are unfortunate enough to fall into them! If there is wind, the wind chill can make the temperature feel like several degrees below 0 degrees C. A down jacket is essential, along with thick mountaineering gloves, hat and balaclava. Without warm plastic boots your feet will be cold and prone to frostbite. Often it can be too cold to stop for breaks, instead most teams opt for a couple of brief pauses for food and drink. Provided you’ve hydrated well at AC, your body won’t need much fluid on the climb to the summit. Those who take two litres of water bring most of it back! Fluid should be stored as close to the body as possible in order to prevent freezing. If this isn’t practical fill up with warm water as late as possible and wrap containers in as much insulation as possible. Although the route to the summit is never steep, there is a persistent incline with very few flat sections to rest. Find a pace that you can sustain. It should be possible to talk and walk without feeling too breathless. As dawn breaks the summit should come into view. Conditions along the final 100m of vertical ascent can be unpredictable. Sometimes, a fixed rope is needed if there are crevasses or steep ice, alternatively the snow can be soft and they’ll be a straightforward path in place. Most teams aim for the central summit of Mera, however it is possible to climb to the higher north summit too. Sometimes this can be reached by following a connecting ridge from the central summit. However this is often crevassed and instead a decision will have to be made 100-200m below the summits over which one you’ll attempt. Often the north summit is steep and requires long stretches of fixed ropes to negotiate safely. To use these you’ll need to be able to abseil and use an ascender device or prussic knots efficiently. From the summit the route is reversed to AC. Although most crevasses will now be visible, the snow will be considerably softer and snow bridges will be at risk of collapsing. Therefore it’s worth remaining roped up until you leave the glacier. Most groups can reach Khare before nightfall. Nepali. English is also commonly spoken. US$ are also in common use. It is possible for most nationalities to obtain a visa on arriving in Nepal. However this can be a slow process and can be delayed further if you fail to bring spare passport photos with you. 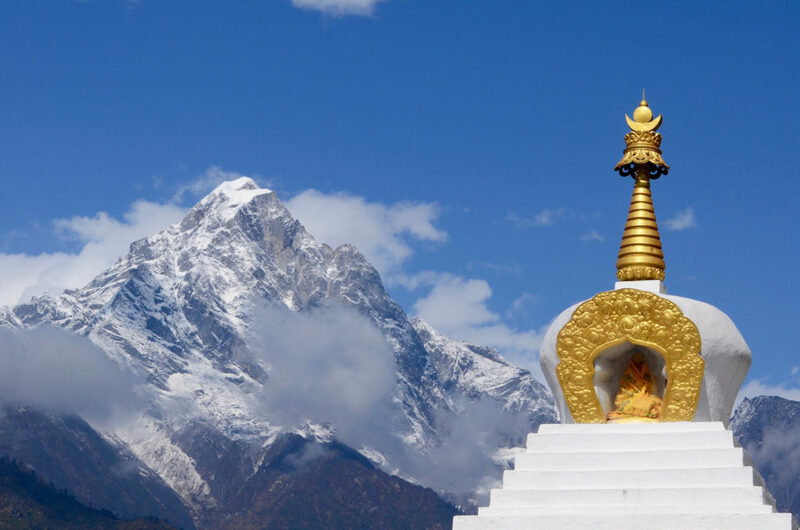 For stays of more than 30 days you will need to obtain your visa before entering Nepal or make arrangements to obtain an extension before heading into the mountains. Your hotel or trekking company should be able to organise this for you. However it will mean leaving your passport with them for the duration of your stay. Make sure that you’re up-to-date with your standard set of childhood vaccinations including Diphtheria, Tetanus, Polio, Measles, Mumps, Hepatitis A and Rubella. TB and Meningococcal Meningitis are recommended if you are working closely with the local population. Hepatitis B is recommended for healthcare workers. Rabies is recommended. However it does not provide complete protection and urgent medical attention is still required. Japanese Encephalitis is recommended if you are planning to spend more than three weeks in rural areas, especially after dusk when infection is more likely. Influenza and Pneumococcal vaccines are recommended for elderly travellers. Malaria prophylaxis is recommended is you travel to lowlands and jungle areas. For up-to-the-minute advice on vaccinations see Nepal International Clinic and Travel Medicine Center sites. Although there are a small number of hospitals in Lukla these have only a limited range of facilities. Whilst they may be useful for treating minor ailments, major injuries and illnesses are best dealt with in Kathmandu. The following clinics and hospitals are able to offer a high standard of care: Nepal International Clinic and CIWEC Clinic. The altitude a helicopter can reach is limited. Above 5000m rescue may be impossible. Therefore casualties above the Mera La will need to be brought down to a lower altitude first. Delays due to bad weather are common. These not only occur high on the mountain but also in the Hinku Valley too. Here, low lying cloud can settle in for several days making rescues impossible. Helicopters will not leave Kathmandu unless the weather is good at the landing site. Ensure that any victim is warm and comfortable. Once airborne the temperature in the helicopter will fall rapidly. Do not assume that luggage will be allowed onboard. At high altitude the pilot may not be able to transport anything more than the weight of the casualty. If supplemental oxygen is being used this should be taken onboard. It is possible to assist the pilot by identifying a landing zone (LZ) prior to the arrival of the helicopter. This should be a flat area at least 150m downwind of residential areas and free of any obstacles such as cables, wires or rocks. The wind direction should be highlighted. This can be done by using pieces of material attached to poles. Lights may be placed in each corner of the LZ. They should be bright enough to be visible by day but not so bright that they blind the pilot. Do not approach the helicopter until the pilot or crew have indicated you to do so. Due to the steep and often broken trail over the Zangmu La, it is rarely possible for yaks or horses to carry the sick or injured. Instead a group of porters, taking it in turns, are needed to carry individuals in an adapted carrying basket. The journey from the Hinku Valley to Lukla in this way may take 24 hours or more to complete. Apart from what you can carry yourself, your personal equipment and group supplies will be carried by porters. These men and women travel to Lukla from low altitude during the spring and autumn climbing seasons in search of work. Unlike Sherpas and other ethnic groups living at high altitude, these people have no genetic advantages over their clients. Since they carry enormous loads (40 kg or more) at a rapid pace they are prone to HAI’s, especially during their first few weeks at altitude. Be aware of this and provide treatment wherever necessary. Although a rescue post is currently being established in Khare for much of the route you will be a long way from medical services. For the majority of the time you will be relying upon other team members and the guiding staff who accompany you. It is important to check that your guides can communicate fluently with you, that they have experience of mountaineering at 6000m and importantly, know how to treat any medical problems that may arise. A limited number of lodges can be found along the route. These can provide a room, food and a warm communal area to eat in. During the busiest times, these can fill up quickly, so to avoid disappointment its worth arriving early or sending porters ahead to reserve spaces. The safety and cleanliness of lodges can vary. Therefore, it’s important to inspect the room and communal area first. Whilst the vast majority of lodges are clean and hospitable, it will be obvious which ones aren’t. Look out for animal droppings and evidence of food remains. Check that you know where the fire exits are. Most lodges are wooden constructions heated with stoves. Therefore, there is a real risk of fire. Take your time on the stairs, often these are steep and uneven. Injuries are common! Watch your head! Lodges are not designed with tall Westerners in mind! Don’t get too close to the stove. After a day spent out in the rain, it’s tempting to get as close to the stove as possible. Unfortunately, the stove and chimney are very hot and burn easily. If you have tented accommodation below the Mera La this gives you enormous flexibility allowing you the option of using either tents, lodges or a combination of both. A popular option is to sleep in tents and use lodges to eat and socialise in. This gives you the advantage of having a warm and well lit space for relaxing and eating after a hard day’s efforts. Some networks provide mobile telephone coverage in Lukla, however this can be very unpredictable. Landline and satellite telephones are available in Khote, Tangnag and Khare. You can expect to pay between $5 and $10 per minute for your call. From March to May and September to November. Above 5000m in the Himalayas the weather conditions are often unpredictable and prone to rapid changes. A night of heavy snow can transform a benign path into a steep and impassable snow slope. Lower down the mountain, freezing conditions are common at night, however daytime temperatures can exceed 25 degrees C. It is therefore essential to be prepared for all conditions – down jackets and trousers at night and lightweight trekking clothes for use during the day. At lower altitudes heavy rain storms are common. Umbrellas are invaluable and can be bought cheaply in Kathmandu and Lukla. A waterproof cover for your daypack is also very useful. Porters will normally wrap your luggage in plastic sheeting, however this is no guarantee that the contents will remain dry. Therefore its worthwhile ensuring that clothes and sleeping bag are stowed in a dry bag inside your luggage before they disappear up the trail! Normally, snow and ice are not encountered until Khare. If dry, the trail up to this point is straightforward and only trekking poles and approach shoes are required. However in the wet, conditions can turn slippery and awkward on steep sections. Once on the glacier, crampons, ice axe and harness are required. Since crevasses are common, it makes sense to rope together despite the dozens of porters who criss cross the glacier alone! On summit day the route rarely exceeds angles of more than 30-40 degrees, however the last 100 to 200m of vertical ascent may be steeper after heavy snowfall. Parties may therefore need to use fixed ropes for this final section. Leeches can be found along many of the trails leading to Mera. These are especially common in the monsoon months. The good news is that they don’t transmit infection. However, they can cause considerable bleeding since they inject a small dose of anticoagulant shortly before drawing blood. In order to control the bleeding apply constant firm pressure with a clean dressing for at least five minutes. Once the bleeding has stopped apply a sticking plaster “band aid” for 12-24 hours. To prevent leeches attaching to the skin, wear a hat, pull your socks up to your shin, wear long trousers and button shirts to the wrist. Whenever you leave or enter your tent ensure that it is zipped up. For much of the time yaks and mules will be sharing the trails with you. Although both are passive and sure-footed creatures injuries can occur. On steep trails make sure you stand closest to the slope and give them as much space as possible! River crossings are notorious for being sites of accidents in the mountains. Take special care in wet conditions since rivers can be high and slips and falls are common. Most crossings on the Mera trail are clearly marked. If in doubt wait for a porter or local guide and follow them! Meticulous Hand Hygiene – As a minimum, it is essential to wash hands prior to eating and following going to the toilet. This should be done with clean water and an anti-bacterial soap. Boil or sterilise water before use. Avoid uncooked fruit or vegetables. Meat needs to be thoroughly cooked before eating. Many opt to eat a vegetarian diet on Mera. After seeing the way raw meat is stored in the neighbouring villages, this is highly recommended! Ensure that all cooking equipment and eating utensils are thoroughly cleaned before use. The use and timing of antibiotics is controversial. One approach that is popular, is to use ciprofloxacin (1g initially, followed by 500mg twice a day for three days) if diarrhoea persists for 12 hours or more. Although minor, superficial injuries caused by ill fitting boots can ruin an attempt on Mera. For many, it will be the first time plastic mountaineering boots have been worn. Ideally these should be tried out at home in winter conditions first. At the very least, wear them on the glacier during a rest day first. Any areas of soreness can then be quickly identified and covered with a protective dressing. Long, warm socks should be worn and boots laced so that the foot is held in place and the ankles have a good degree of flexibility. These can be tightened for descending. Acknowledgements: The authors wish to thank David Hillebrandt, Buddha Basnyat and all those at the guiding company Jagged Globe for their help in the preparation of this article.